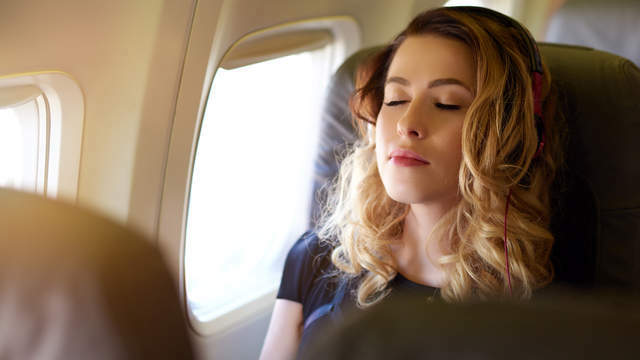 Between the jet lag, dry air, and muscle-cramping seating in coach, flying can really do a number on your health. But one of the most common body complaints fliers experience tends to go overlooked or be blown off as no big deal: clogged or plugged ears. The proper term is “ear barotrauma,” which pretty accurately describes the pain and discomfort the condition typically causes. This complaint isn’t just a passing annoyance. Besides starting your vacation or business trip on a particularly sour note, it can also lead to some pretty serious complications, too. To understand what’s behind that clogged sensation, you’ll need a quick anatomy lesson. Your ear is divided into three sections: the outer ear, the middle ear (which houses the eardrum), and the inner ear. The middle ear is connected to the back of the nose and upper throat via a passageway called the eustachian tube, whose job it is to stabilize the air pressure levels between your nose and ear. “Our eustachian tubes open and close multiple times a day, but the passageway is so tiny that we don’t really notice it as long as it’s moving properly,” says Ana Kim, MD, an otolaryngologist at ColumbiaDoctors Midtown and associate professor of otolaryngology—head and neck surgery at Columbia University Medical Center in New York. “When we’re flying, however, there’s a rapid change in the barometric [air] pressure, which causes a collapse of the eustachian tubes and interferes with the normal air flow from the nose to the ear,” explains Kim. Getting on a plane while you’re sick with a cold or other head infection that triggers nasal congestion makes those changes in air pressure even worse. “If you have an active ear orsinus infection, you’re taking away what little volume of air you have [in the Eustachian tube] by flying, which could cause a lot of pain,” says Kim.Gwen Stefani experienced thisa few weeks ago when she hopped a flight while fighting a cold and ended up with a ruptured ear drum due to changes in cabin pressure, boyfriend Blake Shelton toldEntertainment Tonight. To re-stabilize the air pressure levels and prevent uncomfortable aching, you’ll need to open up those tubes. Here are three things to try if it happens to you. Pinch your nose and blow—gently! To get your ears to “pop,” you can try closing off your nose and mouth, then gently forcing the air into the middle ear. Do not—repeat, donot—blow too hard. Doing so can actually rupture the membranes of the cochlea (the organ that allows us to hear), says Kim. And when that happens, fluid can leak out, causing hearing loss, nerve damage, dizziness, or a type of ringing in the ear called tinnitus. Call it a good reason to keep a pack of gum in your carry-on: moving the muscles of your jaw by chewing, yawning, or swallowing water or another beverage can help reopen the eustachian tubes, says Kim. If you’re traveling with a baby or toddler and you suspect (or they tell you) their ears are plugged up, have them sip juice or water or use a pacifier to get those mouth muscles going. Medications like Afrin shrink blood vessels and reduce inflammation in your nasal cavity. Since it works right away, you can take it 10 minutes before takeoff to prevent your ears from clogging in the first place. One word of caution: Although these meds are over-the-counter, people who have heart problems or are pregnant shouldn’t take them unless they’ve cleared it with their doctor. If the clogging doesn’t go away . . .